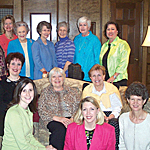 The Arkansas Alumnae Chapter was organized in 1988 and serves more than 300 alums throughout Arkansas. Meetings are held twice annually, generally in the spring and fall, and often in the homes of members. Chapter dues are $15, a portion of which goes to fund the Arkansas Scholarship, a $500 scholarship awarded to a MUW student from Arkansas. Members stay connected and receive updates via email regarding news and developments related to MUW and its alumnae. A great group of 9 MUW alums plus a potential future alumna (Anna Kate Davis) had lunch in Little Rock April 25 at Whole Hog Café. Our newest Golden Girl Frances Dubach ‘59 was a special honoree. We enjoyed catching up with each other and on The W. Those of us who had been at Homecoming the previous weekend shared about the events and our experiences. Everyone was really impressed with our account of the MFAeA's 125th Gala Party! Jane Dennis discussed our Chapter scholarship for a deserving W student from Arkansas, and that she is awaiting word from Shelly in the MUW Admissions Office on a list of incoming Arkansas students for the fall. If anyone knows a current or incoming MUW student who is from Arkansas, please let us know. We updated those in attendance on the new MFAeA Chapter Affiliation Agreement, explaining the legal reason for the Alumnae Association's name change and the different categories of chapters (ours falls into the "traditional" area). 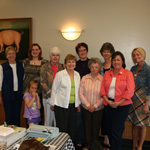 The vote was unanimous that the Arkansas Chapter be an official affiliate of Mississippi's First Alumnae Association. Plans are already underway for our fall meeting on Saturday, October 3, in Little Rock. Dr. Bridget Pieschel has already agreed to be our special guest and make a presentation on her book Golden Days. We anticipate a great crowd and, as always, a lot of fun - so mark your calendars!